Cross County School District has been recognized with six Outstanding Educational Performance Awards from the Office for Education Policy. The Office for Education Policy selects winners based off of growth from ACT Aspire Examinations taken annually by Arkansas public school students. Cross County High School, A New Tech School spent the 2017-2018 academic year focusing on literacy. The implementation of data-driven strategies paid off with the high school ranking 8th in the entire state of Arkansas for growth on the English Language Arts assessment. When comparing high schools in the Northeast Region, Cross County has the second highest growth in literacy, behind only Southside Charter High School. These rankings earned the high school a Best Growth Scores in ELA badge from the Office for Education Policy that will be featured on the district website. The elementary school experienced similar successes in literacy and additional growth in math leading to a #12 ranking in the state for overall growth. This ranking represents Cross County Elementary Technology Academy’s commitment to growing every student in all areas. This outstanding achievement came with $44,925.52 in performance funds in addition to the Best Growth Scores in Math badge. 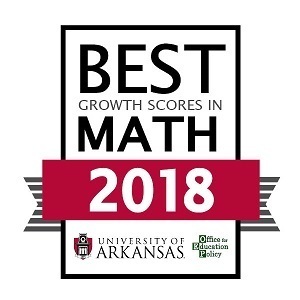 This overall ranking took into account the elementary’s #2 ranking for math and overall growth in the Northeast Region and its #10 ranking for math growth in Arkansas. The Cross County School District has the distinction of winning growth awards at both the elementary and high school levels reflecting a cohesive effort from students, teachers, and administrators kindergarten through twelfth grades. Cross County School District is set to take ACT Aspire Examinations again in the spring with the aim of continued student growth across math and literacy for all students.